As the Cayuga Economic Development Agency’s business development specialist, my focus is new business for Cayuga County. I work to attract new businesses to either expand or relocate here and provide assistance to entrepreneurs who want to start or acquire a business. The attraction side of my work involves collaboration with local, regional, and state partners. These are usually multi-million dollar projects and they can take a few years to materialize. On a smaller scale, I work with dozens of entrepreneurs each year to help them build successful business plans and find connections to the resources they need to start and grow. The following story describes this kind of business assistance that starts with an entrepreneur’s idea and ends with a new retail store, LB Lightning Cyclery in downtown Auburn. It was Mike and Pam Parks’ dream to turn their long time hobby of building, fixing, and restoring bikes into a small business. Having recently retired from his career in government and settling in the Town of Genoa last spring, Mike drafted a business plan and set to work making that dream a reality. From his work with the government, he was aware of the Small Business Administration (SBA) and contacted the Syracuse District Office, who referred him to the Small Business Development Center (SBDC) at OCC. They referred him to CEDA and the Auburn Chapter of SCORE, located at 2 State Street in Auburn. Our first meeting, like most of them, began with learning of his plans to open a retail store to sell bikes and accessories with a workshop to provide repair service. We analyzed his drafted business plan and I helped him improve areas that were lacking information or detail by asking key questions and offering suggestions. He already had most of his plan figured out: the products and services he would provide, which suppliers he would use, the estimated startup costs, and a general location. According to Mike, I “asked a lot of questions throughout the process that helped generate additional thoughts and ideas in the development, operation, and marketing of the business”. One of my strengths is my knowledge of local information. The assistance I was able to provide included filling him in on all of the things going on locally that might positively or negatively influence his plan. Since the Parks moved here from out of state, this local information was invaluable. We discussed things like the Emerson Park Master Plan, the future Owasco River Greenway Trail, the YMCA’s Bon Ton Roulet, Erie Canal’s “Go Bike Erie” initiative, Auburn’s Downtown Revitalization Initiative Plan, and the growing tourism industry. We also looked at the available commercial properties, discussed the developments underway, and weighed the pros and cons of various locations throughout the city. I referred him to other business professionals and made introductions to various business people and bicycle enthusiasts throughout the community to provide further ideas, advice, and assistance. As a certified SCORE mentor, we sometimes co-mentor to assist entrepreneurs in the areas of expertise they require. Mike took advantage of SCORE’s free and confidential services and consulted with Irene Stafford, a former business owner and accountant. With his financials calculated, we discussed available funding opportunities such as local loan programs, those offered by our regional partners, and SBA guaranteed loans. Mike had already enlisted the help of a local commercial broker, but since he really wanted to be in the downtown Auburn area, I referred him to the Business Improvement District (BID), an organization that works closely with all of the downtown businesses, property owners, and tenants. While my focus is all of Cayuga County, our partners at the Auburn BID know the downtown properties inside and out. LB Lightning Cyclery was a good candidate to work with Cayuga-Onondaga BOCES’s Graphic Design & New Media class to have a business logo designed. Mike had a client meeting with a few of the students who would each design a few mock-ups from which he could choose. From there he was able to make some iterations to the design and now has a custom-designed logo with mock-ups for t-shirts, building signs, and stickers, created by Lucas Wingfield, a senior at Skaneateles High School. 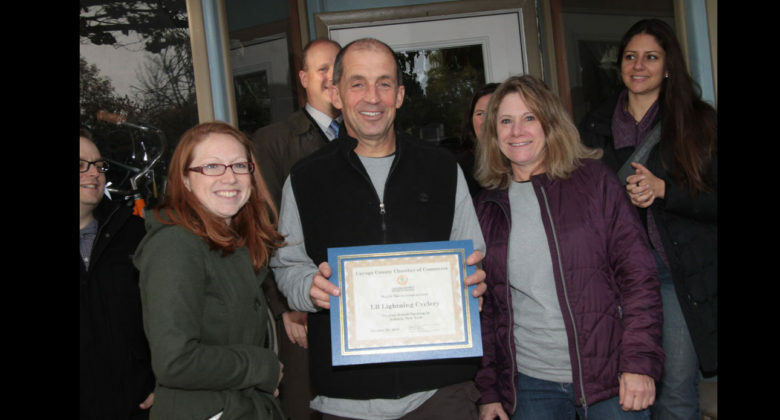 Once LB Lightning Cyclery was ready for its grand opening, Mike took advantage of the Cayuga County Chamber of Commerce’s free ribbon cutting ceremony and officially cut the red ribbon on October 28, 2016. He has since joined the Cayuga County Chamber of Commerce and takes full advantage of all the membership benefits to promote his new business. Throughout the process, I followed up with Mike at key points for status updates, to discover if he had hit any snags, and to discuss strategies to keep everything moving forward. The kinds of entrepreneurs I work with vary greatly from one to the next. Some people are just throwing around ideas, while others have 50 page business plans and patents that will change the world. Therefore, every meeting is fun and interesting and the services I am able to provide change with each situation. If you know someone who is thinking about starting or acquiring a business, please share the information that CEDA and SCORE provide free and confidential business assistance. There are so many services for new and existing businesses at 2 State Street, that you just have to give us a call to find out how we might be able to assist your business! Maureen Riester is a SCORE mentor and the Cayuga Economic Development Agency’s business development specialist, focusing on bringing new business to Auburn and Cayuga County. She can be contacted at mriester@cayugaeda.org or (315) 252-3500. Published in the April 13, 2017, edition of The Citizen.